In our bones we know that stories are not good news. 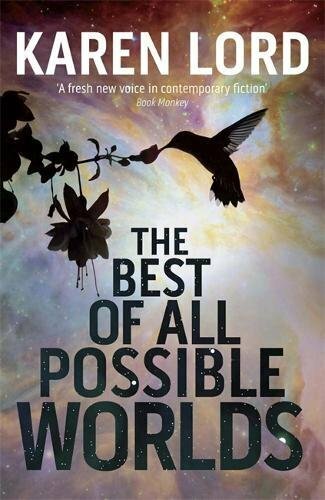 This is not to say that any sane person would actively wish not to know of a good world, a garden we can compost with Pangloss's corpse, a utopia where no dystopian stigmata glare through the skin like Gully Foyle's tattoo; but though we may wish to know of such a place, we really don't want to be told about it. We simply do not wish to be told—indeed few of us read (though some of us may recite)—stories about good and companiable folk who live good lives, who resolve their conflicts peacefully, who allow their children freedom to grow up and enter into polyamorous gestalts smilingly; we resist stories of this sort, though we might wish to live them, because stories set in sustainable worlds are congratulations, they demand the reader's connivance in affirming it was a real nice clambake, we're mighty glad we came: which is to say they are not stories but mantras; a truly sustainable world will be storyless. In our bones, then, we know that stories—certainly tales extracted from the Cauldron of Story I (for one) think of as another way of describing fantastika—are not about sustenance but change. The slingshot endings of our literature, the And they lived happily ever afters, the He had work to dos: they are all subsequent to story, and most of the fiction we read and write in the twenty-first century obeys the instinct that stories stop at the gates to the kingdom. But not all. A problem with Steampunk, a disintegrative rhetoric visible even in an intelligently put-together anthology like Ann VanderMeer's Steampunk III: Steampunk Revolution , is that, for many who write and read it and advocate it, Steampunk is the kingdom.
. . . multicultural steampunk must move from mere aesthetic into active policies that center non-white steampunks and steampunks of colour, and provide ample opportunity and encouragement to reclaim, retell, represent their own histories in narratives that will run counter to a world that would rather do violence to them than let them speak. Nor—even though I doubt Goh is talking mainly about costumes—is it perhaps the time or place to enter a field of discourse where a phrase like "must move from mere aesthetic" can be uttered as though we no longer needed to remember that historically almost every diktat about "mere aesthetic" has come from the kind of oppressive hegemony that Goh is trying to dislodge. My point is something different. It is that the extremely loose set of fictions that were retroactively treated as taproot texts for late-century/new-century Steampunk were in fact pure story, certainly if storytellers are most subversive of hegemony when they tell bad news with what looks like a smile but is not, for the original Steampunk texts are precisely not a nostalgic immersion in some polished-brass, utopianized version of Victorian England requiring only a twitch of the kaleidoscope to come true. The early fiction of an author like Michael Moorcock—whose mid-1960s Jerry Cornelius stories later assembled as The Final Programme (1968) originate and proleptically ironize on the spot the apparatus and clothes-sense of so much later Steampunk—is post-utopia; it does not adulate Victorian England; it eats the ship of state from within, until it is a husk. For most UK writers after him, Steampunk is not a romance, but an escape from prison, in J. R. R. Tolkien's sense that it is a worthy thing to escape a world definable as imprisoning. Early Steampunk is not good news. It derides the world our masters made before World War One, just as the fantasies J R R Tolkien began to write in the trenches cry shame on the century to come. So Steampunk contradicts the Victorian imperium that bequeathed us the world we live in: twentieth century Europe where, as Karl Marx said (it was the most profound thing he or maybe anyone from his century ever said about the times to come), All That Is Solid Melts Into Air. Except for its effluents and frozen music, the twentieth century has indeed become invisible, which may be one reason SF illustrators active before World War Two evoke nowadays such a powerful nostalgia. Frank R. Paul extrapolated from what he could still see, not from what was already obscurely beginning to happen in the heart of the heart of America: the long slow inexorable divorce between energy (which is to say power) and engine (which is to say us), leaving in its wake 300,000,000 solitudes. Except for the fact he thought he was drawing the real world, Paul's work was pure Steampunk. Because Steampunk is visible, it is braille to trace All That Is Solid in the world. The rulers and the inventors and the aerists and the detectives can all be seen doing what they do: running the transportation of the world. Until the counterfactual topples. 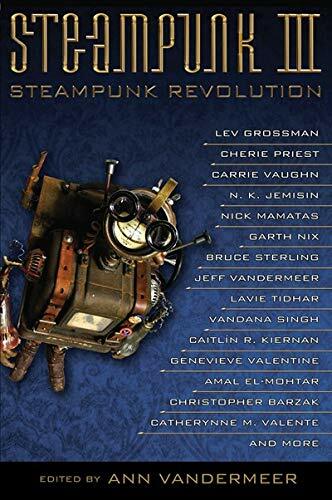 The best Steampunk tales (for this reader) are those which expose the gears of the world, just as though our masters had not betrayed us, and then break the gears, because of course the gears of the world, on exposure, prove to have been broken or (which is the same thing for humans) made invisible. In early Steampunk writers—like Moorcock, Howard Waldrop, Tim Powers, K. W. Jeter, even the supernaturally kindly James P. Blaylock, Rudy Rucker, Christopher Priest, Brian Stableford, William Gibson, Bruce Sterling—the link between history and Steampunk is a dialectic. It repudiates. Some of the stories assembled in Steampunk III: Steampunk Revolution, attempting to fulfill the programme signalled in the subtitle, carry on from there, others play with toolkit, I think less fruitfully, partly because the underlying command that nothing be invisible in Steampunk can create an adhesiveness that binds story to the world being depicted, certainly if the author has nothing subversive to say, so that some tales (no names this time) in the anthology are still-born. Others are not. Nick Mamatas's "Arbeitskraft" (2012), which includes the Marx quote I copied above, quite brilliantly incorporates into its very sympathetic portrayal of Friedrich Engels a savage analysis of what it means when human beings are literally transfigured into chinks in the world machine. Ben Peek's "Possession" (2007) transforms the world into a hole without bottom or god, and immersion of its denizens in eternal darkness as a process of corrosion. Jeff VanderMeer's "Fixing Hanover" (2008) makes a silk purse of story out of a pig's ear: a storyline so heavily trailed that only an intensely skilled unpacking of events could manage to make it new: but VanderMeer, who had sometimes in his earlier work had difficulty with the beat of Next that drives all great story, had no difficulty here. Jeff Ford's fine "The Seventh Expression of the Robot General" (2008) is almost tangible in its melancholy. N. K. Jemisin's "The Effluent Engine" (2011) so winningly depicts early nineteenth-century New Orleans that its failure to do very much to argue an assertion about gender freedom in Haiti seems less an error than (perhaps) a confession that the tale has not yet fully been told (and is a story I'd almost prefer, without being stubborn about it, to call something other than Steampunk). Which is as it should be. The best stories in the book, like all but Jemisin's above, are like almost every good story ever told: they are about things going wrong. As Steampunk itself declares the wrongness of the world, the fit is good. This happened 45 years ago. I still remember it with something like horror. We had been living in isolation, on an island in Greece, without movies or radio. Our only record was "Hey Jude," but the phonograph ran on batteries. We left in due course, and found ourselves in a great European city, on a street with a cinema. We had been out of touch for half a year, and had no idea what was showing, except the posters seemed to describe an action movie, with bravado, exactly what we wanted after months inside our heads. We walked in. The music started, a glutinous fake nineteenth-century upswelling of sub-Smetana cliché, and the penny dropped: we had walked into a romantic costume drama, with bad actors mouthing crap about love. We should have known, had we not been brain-dead from travel: the movie was called Mayerling . 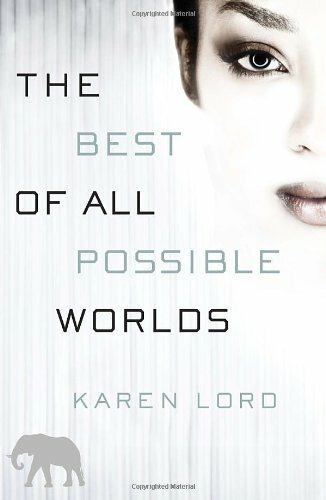 My apologies to Karen Lord, but something milder perhaps but structurally very similar happened between me and her second novel, The Best of All Possible Worlds , which I received as an Advanced Uncorrected Proof lacking any graphics or much information at all. The tale begins innocently enough on an almost empty planet where a man of wit and dignity in middle life has gone on retreat. His name is Dllenahkh. A spaceship lands in the ocean, debouching a fellow Sadiran, who tells him that their home planet has been destroyed by relatives philosophically opposed to their Way. Desolation strikes Dllenahkh. The tone is slightly Le Guin Lite, but we're just beginning. "You—all of you—you were looking that girl up and down!" I didn't know whether to be appalled or hugely entertained. "First Officer Delaru," Joral said in a tone so severe that he almost sounded like Dllenahkh in chastising mode, "while it is true that we areSadiri and therefore not prone to mental distractions, we are more than capable of aesthetic appreciation of the feminine human form." I had no answer to that, so I rounded on Tark. "Well, then, you—you're married!" "I am allowed to look," he said uncertainly. "I'd confirm that with Nasiha if I were you," I said skeptically. I stop there, though Lord doesn't. There may be nothing wrong with this, and I didn't walk out of Mayerling either. But I did rather feel the absence of anything else. So goodbye, Delarue and Dllenahkh. This is my stop. You guys can get it off later.